I took my first test this week....I won't mention what I got on it but it sure was a disappointment. I thought for sure I was going to get an A and that thing but I obviously thought wrong. I better step it up because it is only going to get harder. Work has been going pretty well. I am starting to the hang of things now. I still need to work on a few things but I will eventually get it all down. It has been really nice because I only work 2 days a week. I know that does not sound like a lot and it really isn't but it sure does seem like it when I a putting in 9 hour days...that is enough for me to handle. I like having those 5 extra days to do whatever I feel like doing. Which is usually just sitting around but it sure is nice. I have had a lot of fun the past week or two. My roommates and I like to go out and do crazy things. I have enjoyed meeting all the new people I have met. Kara, Tiffany, and myself all decided that we wanted to go camping on Monday night. We couldn't find anyone to go with so we resulted in building a tent on our balcony. It was super fun. We had smores and ghost stories. It was not exactly like a real campout but it was as close as it was going to get. 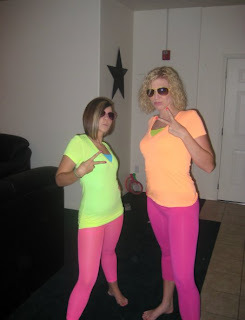 We have attended a couple dance parties where we have had to dress up on neon clothing. Those were both pretty fun. The most fun part about it was actaully getting outfits together to wear. Stop getting bad grades...but it sounds like you are having fun.